Ahead of the 2018 NAMM Show, several images have emerged that suggest that Korg will be introducing a new polyphonic analog synthesizer at the show, the Korg Prologue. The Korg Prologue appears to offer a hybrid analog + digital design, and inherit some architectural and design features from the Korg Minilogue and Monologue. Korg has not made an official announcement about the Prologue yet, so specifications and other details are expected to be coming at the NAMM Show next week. That looks like a proper synthesizer! Different but clearly interesting too. I haven’t bought a Korg since the Poly-61. This is the first Korg to truly interest me in a long time! My goodness! What a beauty! If it sounds so as it looks this might be a very seductive synth! I think they’ve copied the DSI look a little too closely. Looks more like copied Minilogue to me, doesn’t it? Fingers crossed it is at least 6 voices. Though, the voice mode icons suggest four. 8 voices or 16 voices, depending on the keyboard size. 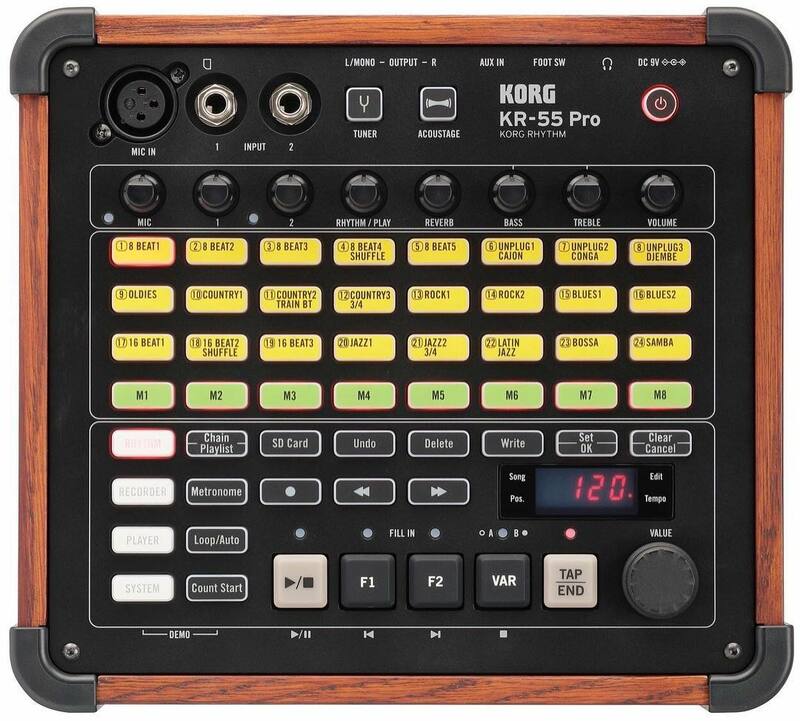 Look here for more information: https://www.reddit.com/r/synthesizers/comments/7r48pa/korg_prologue_namm_2018/ If that thread is true you will be having the choice out of either 8 or 16 voices for $1500 or $2000. It has a digital OSC above the analogue ones. But just 1 LFO. Still a beauty but quite some more than a Minilogue which is already able to produce beautiful sounds. Two different synths in the pic. A 4 octave and a 5 octave key version. Could be 2 different voice counts on them. One can hope. 61 = 16 voices. 49 = 8. One LFO, limited modulation options, less FX, and it still remains to be seen if there is aftertouch… That said, the digital options are welcome. According to gearnews there is a 49 key 8 voice for $1500 and a 61 key 16 voice for $2000. I think they look great and I bet they will sound fantastic. That being said I’m not selling my minilogue and saving up. Who knows though, maybe the sound will blow me away. Again, Korg made the right choices: the 49-keys will be able to compete against the DeepMind, while the 16 voices beast is going to be a modern (and cheaper) alternative to classic polysynths such as Dave Smith’s. This is why Korg is by far my favorite manufacturer (along with Nord). I say in keeping with the -logue pricing it sells for 1000-1200, 1300-1500 respectively. Pricewise, I thought Korg were gonna try and compete against Behringer with their Deepmind line, but Korg is going the DSI Rev2 route. Generally speaking musics greatest sounds have come from poor/urban enviroments. So while your tired of cheap synths some 17 yr old from Detroit is gonna make a killer record with a couple volcas. The Minilogue or the Volca’s aren’t well made and great sounding? DX7’s go for sub $300 constantly and they are a dime a dozen. Hardly an apt comparison to a fully analog synth. Musical instruments aren’t and shouldn’t be a rich man’s commodity. in the early 90s, analog synths went for $200, so I don’t understand the relevance of your point in context to the original comment. Yes! Wood cheeks, that’s another 500 bucks! Looks amazing, but why one LFO? Because the Volca Beats was missing cowbell and rimtap, the Volca Bass was missing TB- like features, and this Polylogue is missing about 2 more LFO’s. Easy, easy things to include but when designed by an accountant or committee? Are the envelopes always retriggering to zero or can you have other modes? That is the only thing i that rly bothered me on the minilogue. If it has different retrigger modes for envelopes i’m very interested. I’m glad Korg has figured out that there’s a market for synths beyond the budget mini synth market. Korg pretty much owns the entry-level synth market, but they didn’t have any pro-level synths. This looks like it will change that completely. This looks like it’s designed to give people an alternative to Dave Smith’s synths – which is a great thing, because it means that the synth market is growing enough to support several companies making high-end synths again. REALLY looking forward to hearing what this sounds like. I’m expecting it will cover analog sounds as well as or better than the Minilogue, but will have a much wider range of possibilities, because of the digital oscillator. Only if you don’t count the Kronos / Krome / Kross and KingKorg series as “pro.” More accurate to say Korg didn’t have a pro-level analog synthesizer, but they had plenty of VA / rompler synths aimed at the pro market, not to mention things like the SV-1 stage piano, etc. Best gear news I’ve heard since the standalone MPC’s. Another keyboard….meh. I find desktop synths or sequencer hybrids like Minibrute 2s or Circuit Monostation way more interesting at this point. And triple the price of a Minilogue for double the voices? Not sure if an extra oscillator and some digital fx are worth the upgrade, It really depends on the sound at the end, because 1.5k $ for something that sounds like a Minilogue with 8 voices would be too expensive. Gorgeous. I look forward to seeing the specs, but it seems like we have the PolySix’s modern heir (based on the Monologue’s filters, I suppose). Korg made a great job with Minilogue and Monologue anyway, it was just a matter of time. If it isn’t priced above the 1500/1600 € price tag, it’s going to smash up the DeepMind. P.S. +1 for the wooden sides. You can`t possibly make a more boring demo video than this. Reminds me of me when i am jamming but on a bad day without ideas. I don`t hear 1 fresh sound in here. I think i will wait for Marc Dotty or something to review it. But whats up with the price? Great synth but 1500 ? That means the Minilogue-Monologue group affordability was a vision that died when Tetsuya left Korg. HOLY MOTHER OF GOD!!!!!!!!! GIVE IT TO ME BABYYYYYY!!!! I think they will release a desktop version later this year……. http://www.korg.com/us/products/synthesizers/prologue/ sorry i posted the dutch link…. Thanks for posting this video. Sounds very interesting and flexible. Great job, Korg. And thanks for not making us wait until the start of NAMM. However, I would really miss the motion sequencer from the Minilogue. That really made a basic analog synth comparable to some software synths in terms of modulation possibilities, imho. Like the digital oscillator on the Pro though. Lots of potential there. And nothing in theory is stopping Korg from eventually releasing a larger Minilogue, if there is a demand for it. (I actually prefer Korg’s Slim-key design over full-size keys). very bad news for rolf wöhrmann and waldorf. if they had their quantum ready last year, people would have bought it back then. now korg has the advantage. Imo, the Quantum is different enough not to be affected very much. If someone wants classic wavetables, they know where to go. And Korg now distributes Waldorf products, as you know. But the Prologues seem very DSI, as others have remarked. If anything, Korg is late to the scene. The Prologue has to compete with the REV2s in the $1500-$2000 price range and the Deepminds in the sub-$1000 range. Waldorf is doing their own thing in the $3000+ premium market range. I want to want it. It LOOKS classy and very ergonomic, but sonically I think I have all of its bases covered. OTOH maybe I should sell my OB-6 and Jupiter-6 to pick up this bad boy and be left with a pile of cash. An 18 voice synth with ony 1 LFO. You are kidding me???? Why a fatal flaw in every Korg product? This can be said about every product from any perspective. Just accept them for what they are. At least its not like Roland who have made it into an artform to put a fatal crippling flaw in every product. eg Drop into multi mode, Fx sound like rubbish etc. etc it never ends with their products. Its like they sit around a board room and decide what to make us cry with later once we have brought the product and discover it. Finally! Korg realized they should be painting white lines on the top of the knobs! Wait…. they dropped the motion sequence feature? $1500/$2000 and no sequencer at all? Meh,1 LFO, no aftertouch, no poly portamento… DM12 is a much better buy, hell even the the overpriced DS line at this price range is better. I’ll pass.